Guru Nanak Dev ji, the founder of Sikh Religion gave a new vision of life and a new concept of respectful living. His divine message, rooted in purity, truth and simplicity, pierced superstitious walls and won the heart of the people. Sir dhar tali gali meri aao. Sir deje kan na keeje. It took 230 years (1469-1699 CE) for the followers to get completely familiarized with the new path. In fact the master plan and the blue print of the new path was sketched and displayed by Guru Nanak Dev ji and the successor Gurus added to the completion to the plan. Practice was made more important than the precept. History bears witness to the fact that each Guru remained steadfast on the moral and spiritual ground as ordained by Guru Nanak Dev ji. The Gurus, throughout their lives, remained a perfect personification of the spirit which later on culminated as the spirit of the Khalsa. This spirit was for the welfare of the entire humanity. Manas ki jaat sabai ekai pehchaanbo. “Recognize all human beings as one and the same”. In 1675 CE, Guru Tegh Bahadur ji the 9th Nanak gave supreme Sacrifice in Chandni Chowk, Delhi, India to save Hindu Religion from the hands of Mughal Emperor Aurangzeb who was bent upon converting all of them to Islam. His martyrdom perhaps , is the only example , in the history of the world, of a life given for the protection of religion of others and for the freedom of conscience. It was this unique martyrdom and the circumstances there after in Delhi at that time, which made Guru Gobind Singh ji think for the first time, to give his followers (Sikhs) a distinctive identity, so that they may become fearless and may not be able to hide even if they so wished. Guru Gobind Rai was nine years when his father Guru Tegh Bahadur Sahib ji made supreme sacrifice. He organized Sikhs and led them to follow spiritual route to attain union with Waheguru (Almighty God) and at the same time, trained them to be self defendant and guard the helpless against injustice, suppression and tyranny. He observed deeply the effects of the concepts, mainly of Miri-Piri (Saint Soldier) given by his grand father Guru Hargobind Sahib ji and the impact of the supreme sacrifice of his great-grand father and the prince among the martyrs Guru Arjun Devji on his followers . At the age of 33 i.e. 24 years since the Guruship, Guru Gobind Rai was set out to accomplish God’s spiritual mission started by Guru Nanak Dev ji of creating ‘Khalsa Panth’ (God’s Religion) as referred by Bhai Gurdas II, a contemporary poet of Guru Gobind Singh ji who wrote as : Gur Sangat keeni Khalsa manmukhi duhela, Vah vah Gobind Singh aape Gur chela. He chose the day of Vaisakhi for such a grand and historic venture. Guru ji has been quoted to have not made any public appearance for over 11 months. 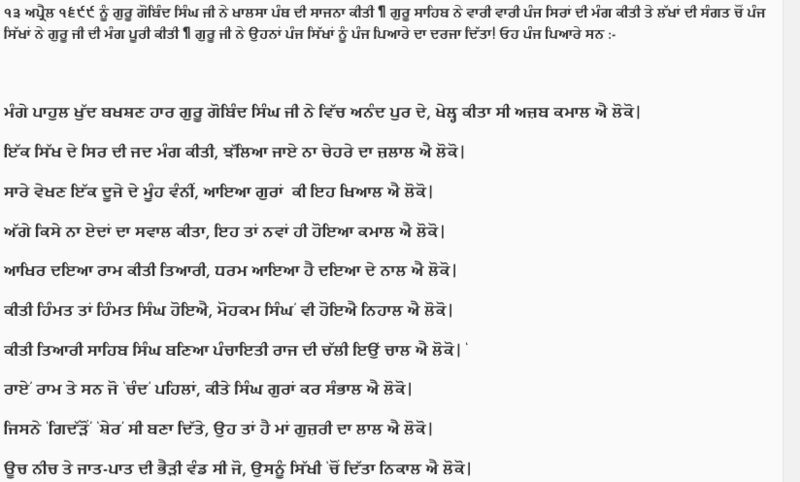 In early 1699, few months before the Vaisakhi day, Guru ji sent a special invitation to the Sikh all over the country to join the special Vaisakhi Diwan in the town of Anandpur Sahib in Punjab State of India with special directions not to cut any of their hair and to come with their turbans on . As the day came nearer, many Sikhs started to come and gather at Anandpur . It is estimated that close to 80,000 Sikhs had gathered there. A stage was set up with a tent pitched up near by. The congregation was eagerly waiting for the Guru to come. Guru Gobind Rai appeared on the scene. He raised his naked sword in the air and Shouted, “My dear Sikhs! Today I need a head. My sword wants to taste the blood of a Sikh. Is there any among you who is ready to offer his head to me.” The crowd listened and wondered why the Guru asking for a head. This amazed and horrified many. There was a pin drop silence. Some were looking for the way to escape. For the moment, no one came forward. Guru ji repeated the same demand of a head again. On Guru ji’s third call, a Sikh named Daya Ram, a Khatri by caste from Lahore came in front of the Guru with head bowed and hands folded. Firstly, he begged apology for not responding the Guru’s first call and then humbly uttered that his body and soul belonged to the Guru. Guru ji took him to the near by tent. A few minutes later the crowd heard a big sword sound. Guru ji came back with blood smeared Sword. The situation grew more amazing. It became difficult for some to breath. Guru ji repeated the same call for another head and successively Dharam Das, a jat of hastinapur (Delhi) ; Himat Rai, a Water carrier of Jagannath puri ; Mohkam Chand, a washerman of Dwarka and Sahib Chand, a Barber of Bidar came forward and one by one taken to the tent. The vast gathering was getting eager and anxious to know what was going to happen next. It is said that the ruling Emperor Aurangzeb had sent a Hindu convert spy to closely monitor the event. He just managed to catch the glimpses of the heads separated from the bodies inside the tent. After some longer time than before Guru ji came out of the tent with the five Sikhs all wearing the beautiful colored robes. Their appearance looked just the same as the Guru’s. Guru ji announced that the five Sikhs have shown great courage and loyalty by offering heads to their faith and from now they will be known as the Panj Piyare (Five Beloved Ones). Guru Ji knelt before Panj Piyare and requested them to bless him with Amrit so that he could become the member of Khalsa Panth and from Gobind Rai to Gobind Singh. This signified that the Guru gave all the glory to the Khalsa and the importance of Amrit from which Guru himself did not want to be deprived of. 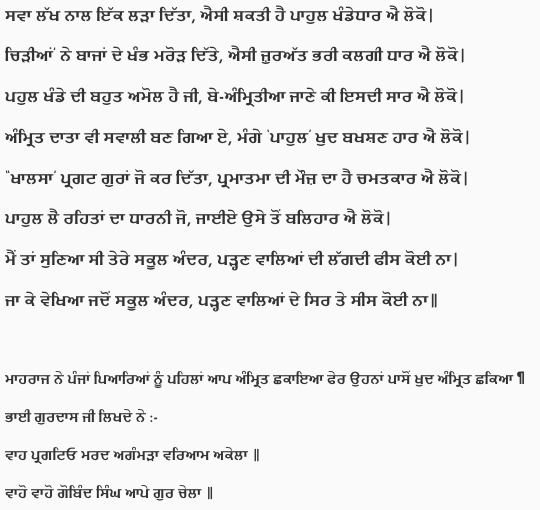 This is the reason why Guru Gobind Singh ji is referred as “Aape Gur Chela”i.e Guru as well Disciple at the same time. As mentioned earlier that Emperor Aurangzeb had sent a Hindu Convert spy to watch the entire event and report him accordingly, he is said to be a Hindu scholar and was forcibly converted to Islam and his name was Abul Turani . He witnessed all and was left spell bound. He repented, cursed himself, wept bitterly, explained all he was deputed for which Guru ji already knew and wanted to be enrolled as a member of Khalsa Panth. He took Amrit and was named as Ajmer Singh .Later he sent his resignation to the Emperor alarming him for the stoppage of all his evil designs against the visible God in the form of Guru Gonind Singh. Shaheed Bhai Kulwant Singh Varpal | 14 February 2011 | Horrible Atrocities Committed By Indian Security Agencies & Police.